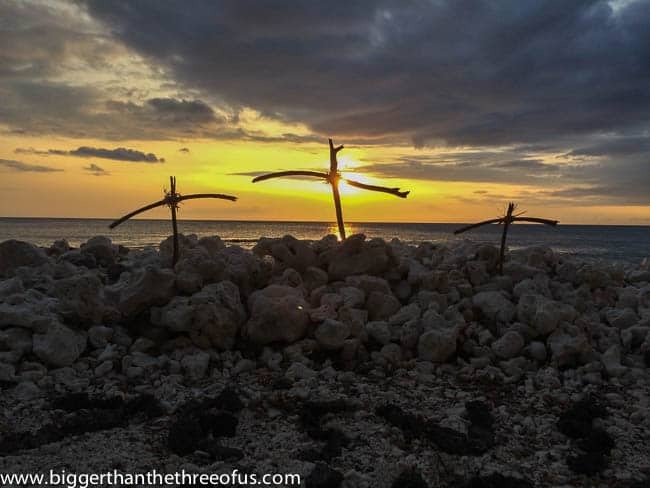 I’m finally getting around to wrapping up the blog post recap on our Hawaii trip. 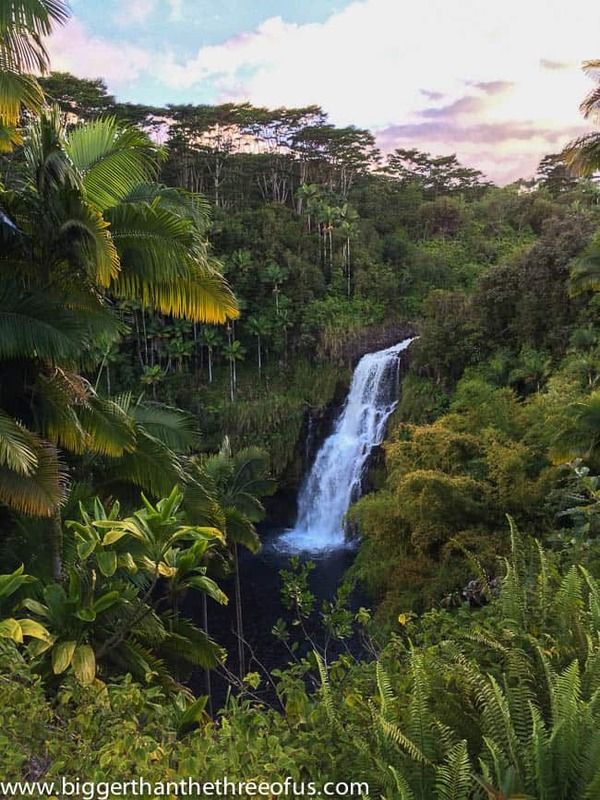 I already recapped our first week which was spent on Kauai. 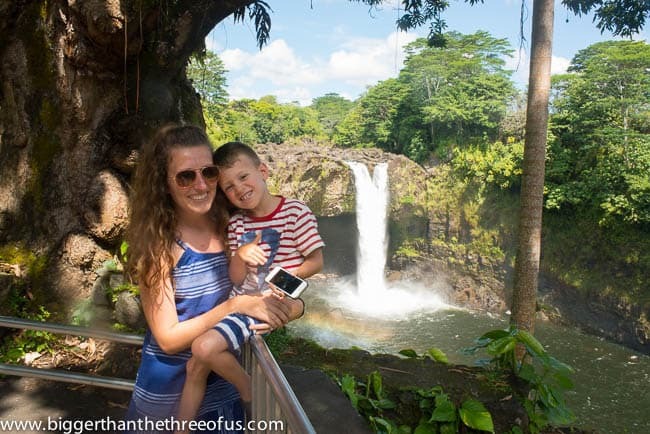 Today, I’m talking about our trip to The Big Island and basically reviewing it based on Traveling to the Big Island with a Child. 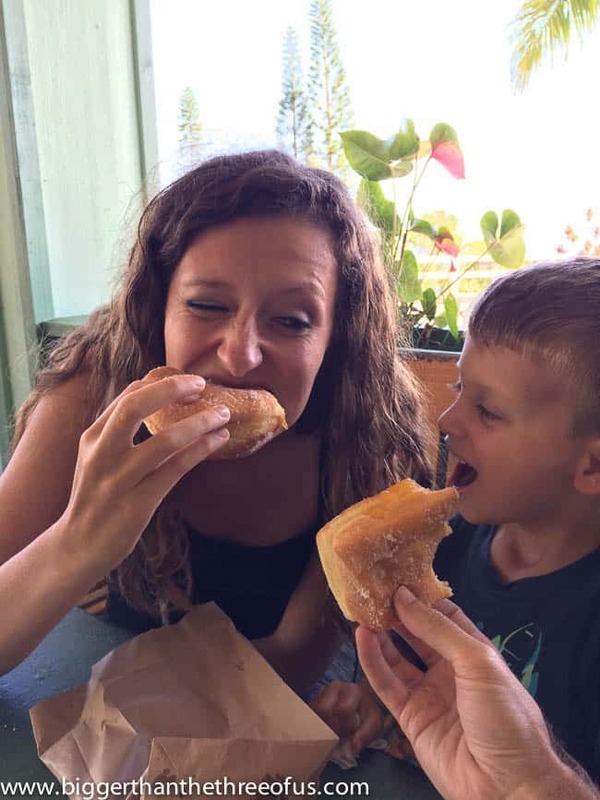 When I was researching our trip, I tried to make sure to read some mom blogs on traveling to Hawaii with children. I don’t think an entire trip needs to be centered around kids, but I do think that having things to do that are kid-friendly are really important. 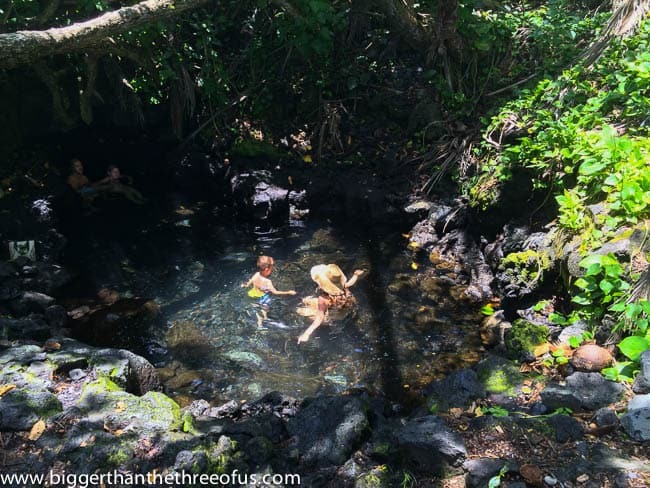 Anyways, my hope is that if you are traveling to the Big Island then you could find things helpful in this post and, if not, well, you are missing out! Ha. No, but seriously, we love to travel, so it’s also nice for us to have a condensed blog post to remember our travels. Here’s what we did: Flew from Kauai to The Big Island (this took about 3.5 hours with a small layover in Honolulu). We were pretty tired after traveling from Kauai to the Big Island, so the first day on the Big Island, we just stayed around the resort for the most part. We had planned for the first few days here to be relaxing. Greyson was pretty intrigued by the gondolas that you could ride from your hotel room to the lobby and other parts of the resort. So, we rode the gondolas, took the train or walked around and just explored. 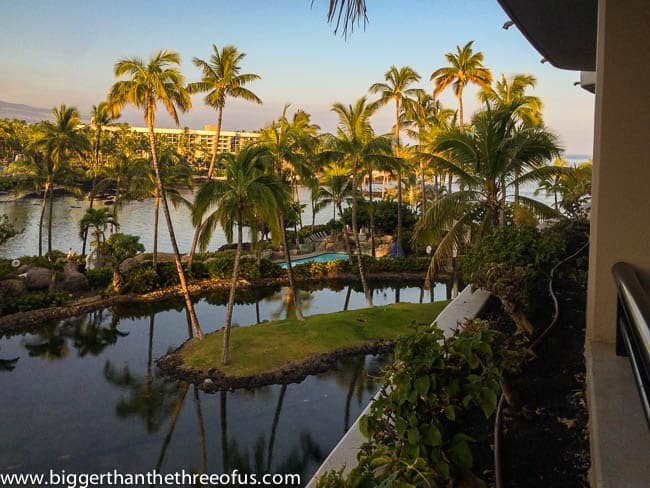 We stocked up on breakfast food and ate on the lanai all the mornings we were there. We all get up really early on vacation so it’s just easier to do that most mornings. It took awhile to orient ourselves within the resort because it’s HUGE, but we finally got the hang of it. 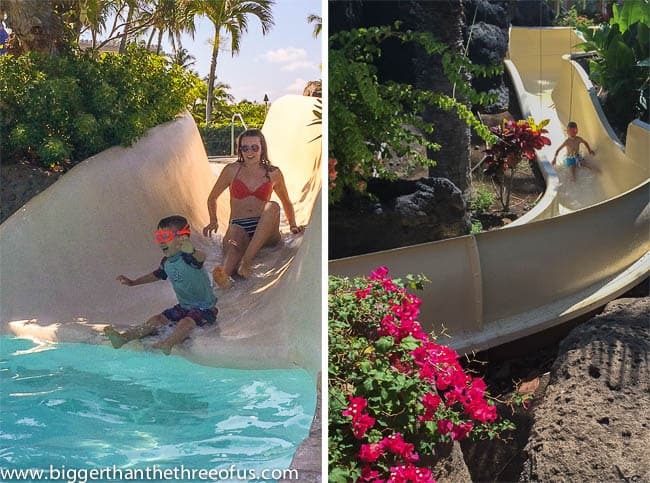 Greyson loved the many options for swimming and, for the most part, it was really a perfect children’s resort. We ate lunch at the resort (the Marina), but I wouldn’t recommend it. Actually, we ate two meals at the resort and neither were good, so I wouldn’t recommend eating on site at all. BUT, the complex is really large so it does take awhile to get off site and to another restaurant. About 35 min. from the resort, is Big Island Brewhaus and we’d definitely recommend it. It’s a quaint brewery/grill which is almost a dive but family-friendly. We went there twice and liked everything we had. *Overall, the Hilton Waikoloa was just ok. It did have the perfect water spots, but we like to eat GOOD food and it was time consuming to ride the gondolas or train to the lobby and then walk to the parking lot to get the car. After that, like I said earlier, you pretty much have a 30 min. drive to get to anywhere that has well-reviewed LOCAL places. So, if you are a resort-stayer (lounger) and have kiddos this might be the perfect fit for you. For us, the 3 days there were definitely long enough. 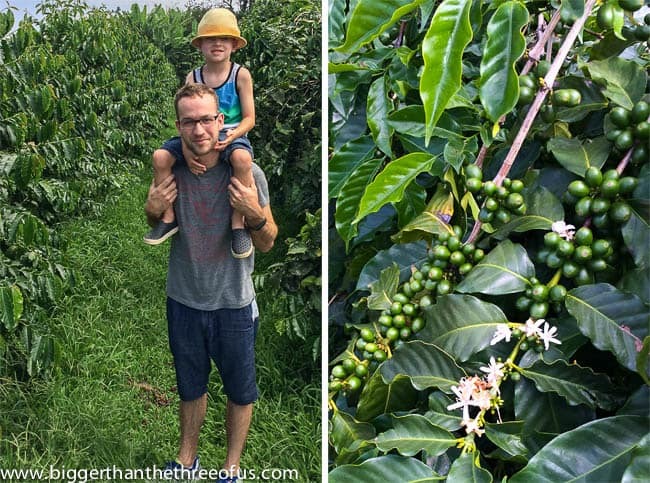 We decided to hit some coffee plantations on day 2. This was one of our must-do things on The Big Island. We took two tours, one at Greenwell Farms (if you only do one tour – do this one!) and one at Hula Daddy. Both were really good and different from each other. If it had just been Luke and I, we would have hit multiple different coffee plantations during the whole day. They are all pretty much grouped together within a 2 hour drive on the same road with multiple different cafe and art shops along the way. But, since G was with us, we grabbed some lunch at a food truck, followed by ice cream (you have to get Island Dreams ice cream wherever you go… it’s so good!) and stopped by a park for a bit. 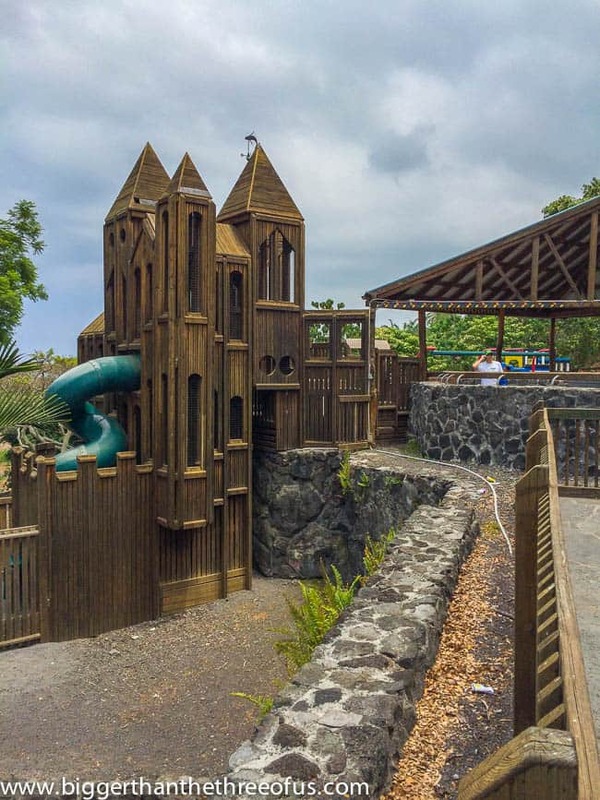 Kauai and The Big Island both have these amazing wooden parks. They are mazes with slides and tunnels… they are really pieces of art. Greyson loved them so we tried to scout them out wherever we went. 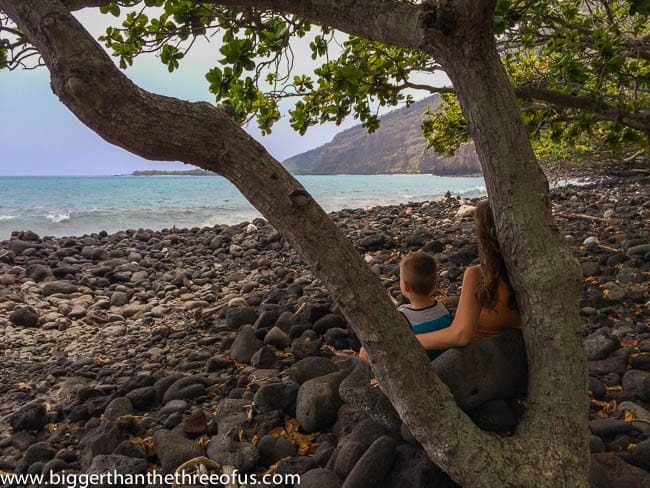 After the park, we drove down the coast and stopped at Kealakekua Bay & Refuge to try to see some dolphins. We hit the area in the afternoon which, unfortunately, is not prime dolphin spotting time. But, we had fun looking at the bay anyways. Luke decided to rent a board in Kona and surf. I could tell that Greyson could use another day of down-time (AKA a nap), so him and I stayed at the hotel and swam, had lunch, watched the dolphins and ate the biggest ice cream sandwich ever. That night, we checked Greyson in to the kid’s club so we could have a date night. We went to dinner and then walked around the Anchialine Ponds Preservation Area that was close to the hotel. The preservation area is really interesting, but there is a trail along the beach right behind it that is just beautiful. We checked out of the Hilton on day 4 and decided to hit the beach before we left the Kona area. We went to Kekaha Kai State Park and it was great. There are, I believe, 3 beaches you can get to from two different parking lots. We parked in the first parking lot and took the trail north (about five minutes) to arrive at Mahai’ula Beach. It has lots of sand on the beach but was a bit rocky in the water (definitely a spot where you wanted water shoes). The beach was really picturesque though and had gentle waves which made it great for swimming. Another huge plus was there were sea turtles swimming all around us. Seriously, like 20 turtles at a time and you could get pretty darn close to them. To the right of the beach, about a 20 min. (HARD) walk is Makalawena beach. I walked there by myself to see how hard the walk was and it would have been too much for our little guy after already playing in the sand/water for awhile. It was gorgeous though and I would definitely recommend packing a cooler, umbrella and going there. 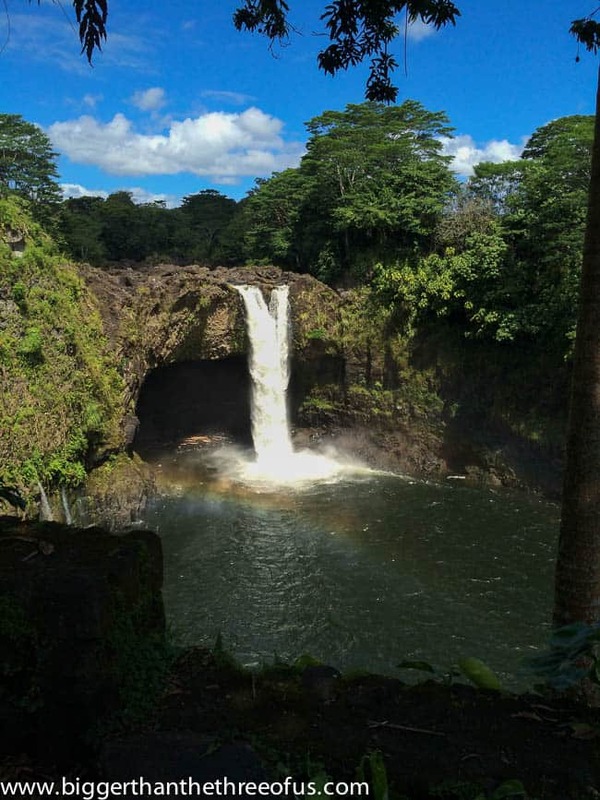 We left in the early afternoon and drove to Hilo. The Big Island is interesting in that the two major areas aren’t far away from each other in distance but it takes a bit to drive. I think it took us about two hours to get from the Kona side to downtown Hilo. We drove to our B&B (The Inn at Kulaniapia Falls) and checked in. We booked the Pagoda House which was a two story small house that looked just like a Pagoda. The views from the front of the house and driveway was their main draw… Kulaniapia Falls. It doesn’t look that big there, but the falls were massive. The owners of the property had maintained/imported a bamboo garden and trails down to the falls. At the base of the falls, you could swim or borrow a kayak. 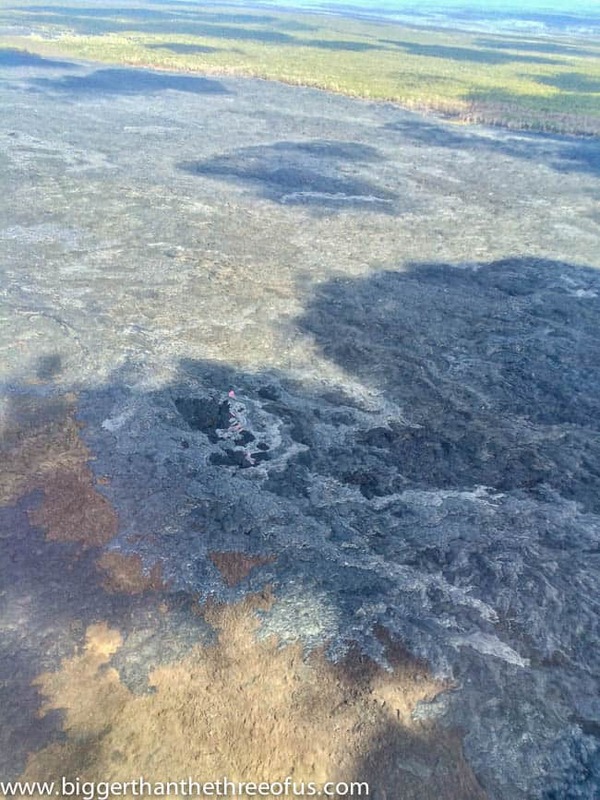 The owner said that the pond at the bottom was over 40 ft. deep. We didn’t swim in the falls, because their policy is no one gets to swim under the age of 16. It did look pretty fun though. Luke took the bamboo trail and went down there and he said it was pretty, although filled with lots of mosquitos. Hilo in general is the rainforest part of the The Big Island. The humidity was crazy and that comes from a girl who lives in MO and deals with humidity. 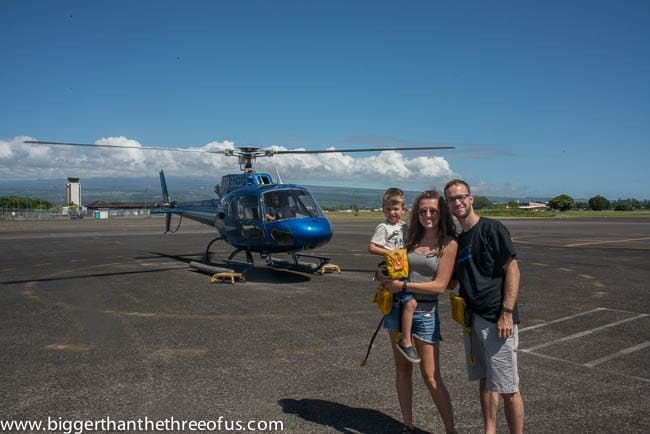 Before the trip, we booked a helicopter ride (Blue Hawaiian – would definitely recommend them) to view the volcano from above. None of us had ever ridden in a helicopter so the novelty of it was quite fun. 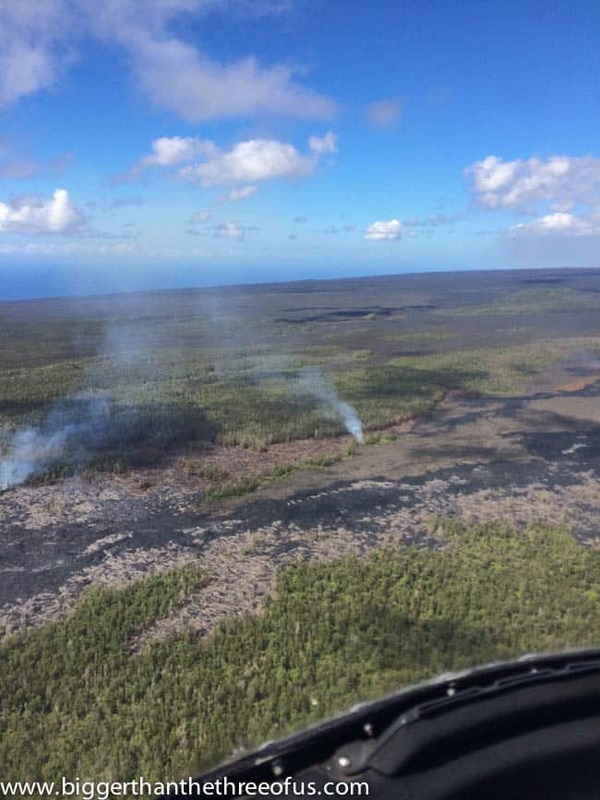 We flew around and saw waterfalls but spent most of our time going over the volcano and the new ground that has been coming up since the lava burned through. We actually got to see lava (not the red-crazy flowing lava that you see in the movies), but lava nonetheless. For those of you who know our little guy, Greyson, you know that he’s quite the talker. Which is pretty crazy, because both Luke and I are not. But anyways, he talked and talked and asked questions to the pilot through the headset/microphone. He LOVED it. It was pretty cute to see… I only hope the honeymooners behind us weren’t annoyed. lol. After the helicopter ride, we drove up to the park. There are tons of things you can do in the park. 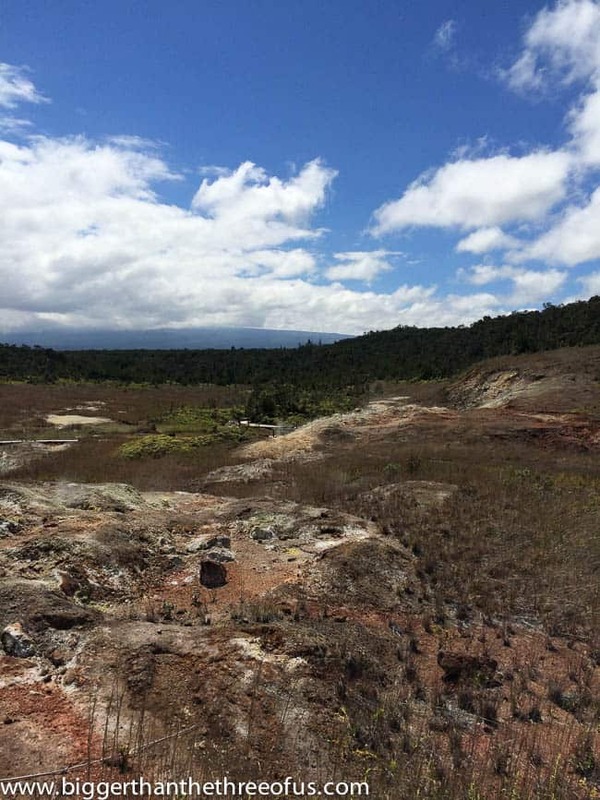 You can hike, view the exhibits, stop and gawk at multiple different steam vents, etc. 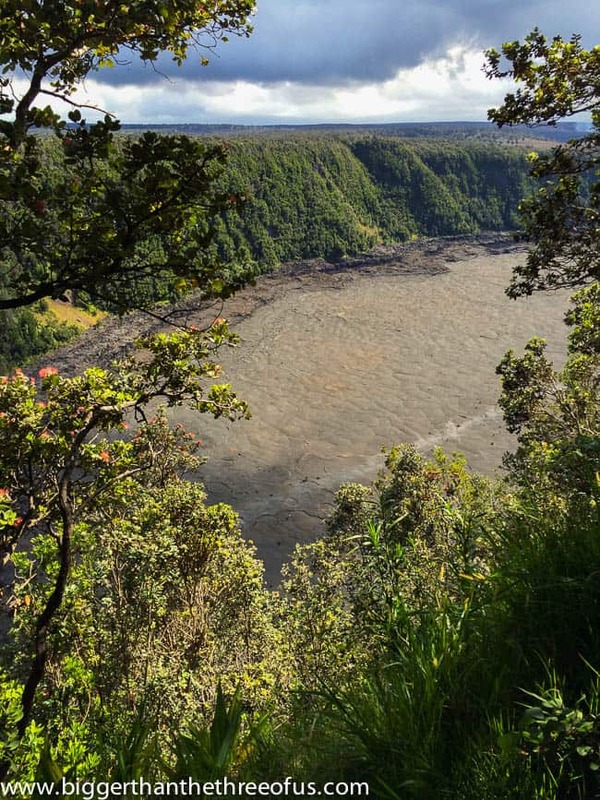 We did a few hikes (a short one around a steam vent and through a lava tube). To be honest, Luke loved the park and could have hiked and stayed there for a few days. Me on the other hand, eh, I wasn’t awed. You can see a steam vent in the picture above… look to the middle of the picture. 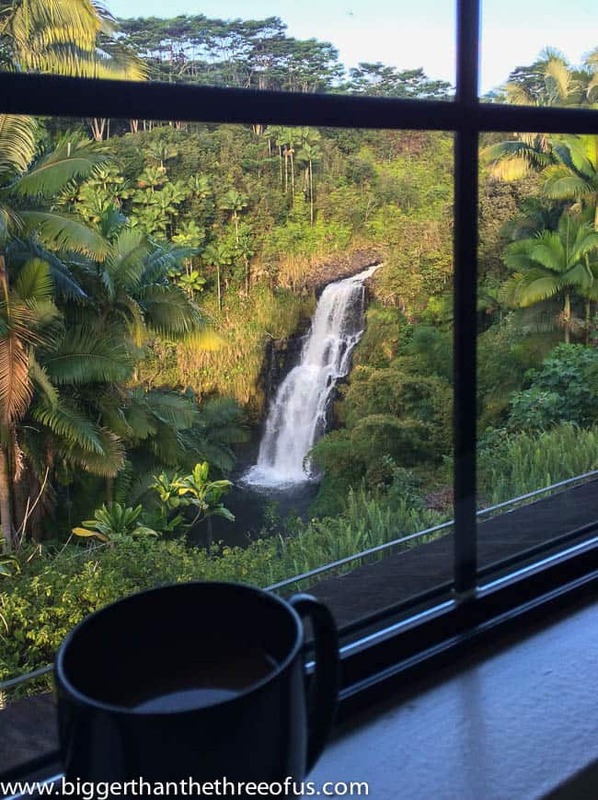 We started each morning off right – with coffee and a view from our bed. Seriously, my pillow was right next to my coffee. It was really pretty. After breakfast onsite, we headed to Rainbow Falls. See if you can see it. In the morning, there is always a rainbow. Pretty cool right? 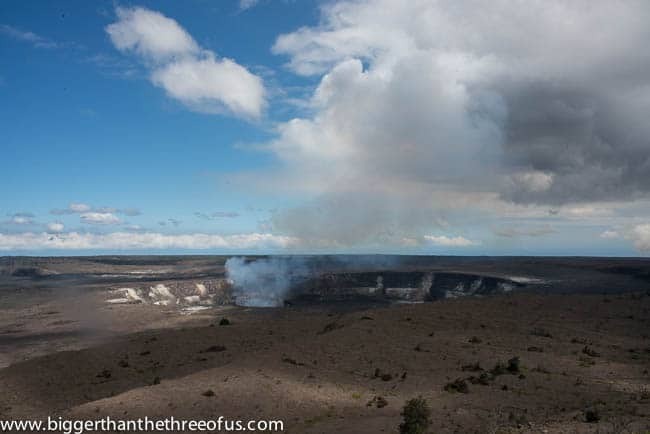 After that we headed to Ahalanui which has a natural heating system powered by the Volcano. Basically, it’s a HUGE hot tub. Greyson had a blast there. It wasn’t very picturesque but was pretty interesting. Waves crashed gently over the wall, and it was warm. Definitely a different experience. 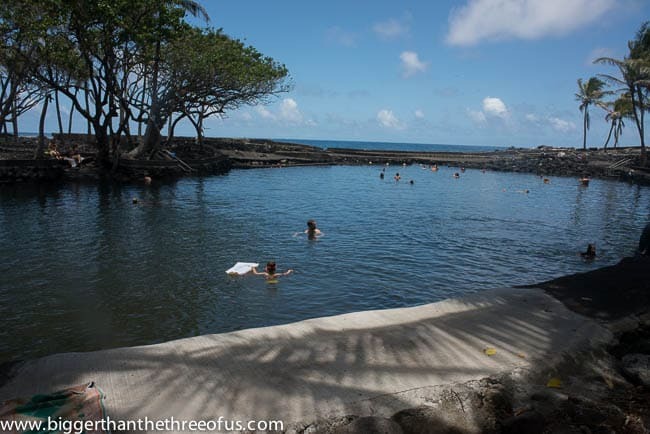 After we left Ahalanui, we headed down the road five minutes to Isaac Hale Beach Park. 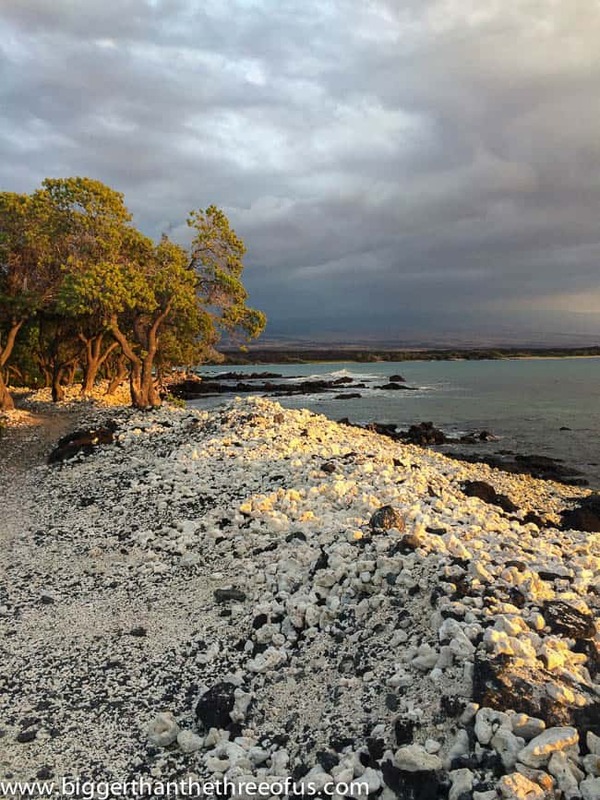 Hilo isn’t known for their beaches but if you wanted to go to a beach then this is one of them. It’s not very pretty and the swimming can be dangerous. But, around the beach about fifty yards is a natural warm water pool similar to Ahalanui but much smaller. We swam in there for a bit. On the way back to the B&B, we stopped to pick up Macadamia Nut Chocolates. Walmart had the best selection for the best price. We bought a few boxes and that wasn’t enough! They were so good! On our last day, we had to get from Hilo to the airport by noon. We took the scenic route back and just tried to enjoy the ride. 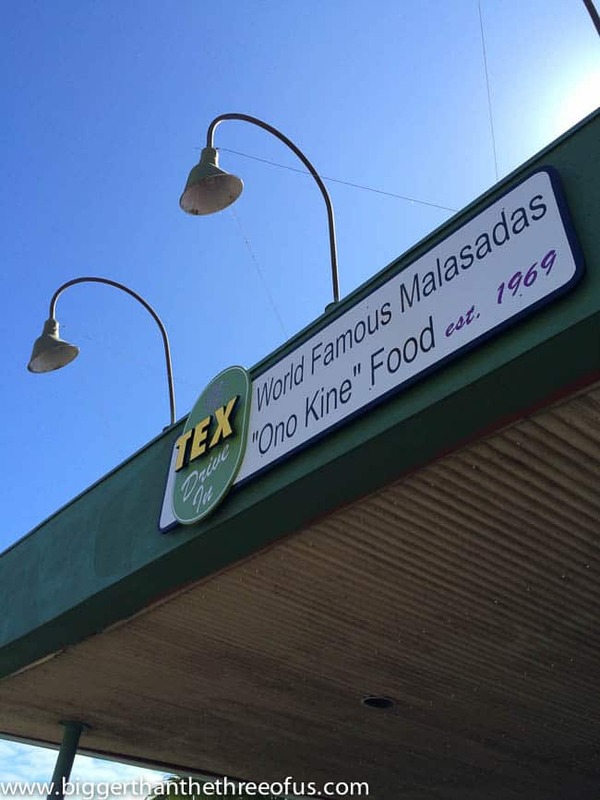 The only stop we made was to stop at Tex Drive In for their Malasadas. These are like a fried puff roll. Seriously, amazing. Don’t miss these. If we would have gotten them earlier in our trip, we would have bought a dozen. We all LOVED them. Whew, that was a lot! I’m rounding up our places that you have to stop by. Have a great weekend! I’ll be back on Monday with another #knockoutknockoffs with my Knock Off girls.